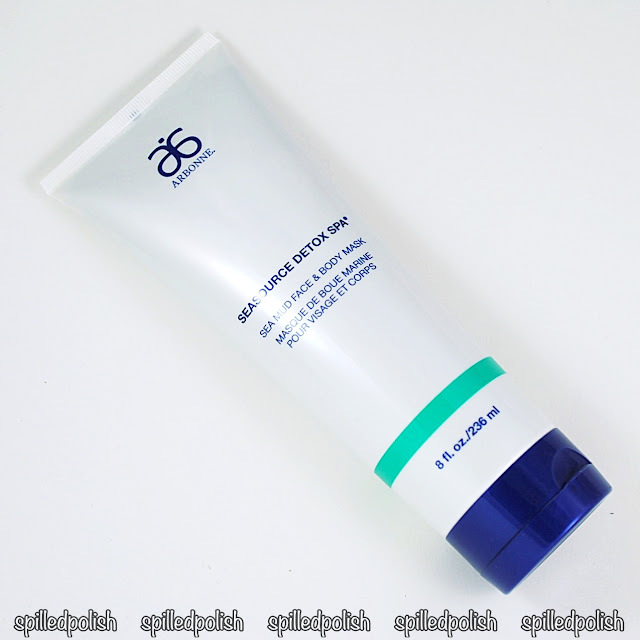 I received this Sea Mud Mask from Arbonne that works great on your face and body. I've never heard of a mud mask that works on your body and face, so I was really intrigued to try this. If you've been reading my blog for a while, you'll know I love to take care of my skin and give myself facials. I was really excited to try this mud mask out! When I got this in the mail I was really surprised at how big it was. This will definitely last me a very long time! Arbonne's Sea Mud Mask is used to cleanse and draw out impurities from the skin's surface, helping prevent clogged pores. The formula of this mud mask is amazing - it's a consistent thick formula and dries in the time frame specified. Like any mud mask, you apply an even layer all over your face and then leave it on for 10-15 minutes (or until it's dried completely), then you rinse it off. My face felt tingly while it was on and I quite enjoyed that because I personally like to feel the effects of products so I know it's doing something. I haven't had any time to use this on my body, but I'd really like to try soon as I've never used a mud mask anywhere but on my face. If you're looking for your next mud mask, be sure to check out this one from Arbonne!